When I started reading posts in your A-Z Challenge this year I never imagined that you would be able to track so many people who had contact with Thomas Allen. To find that the pastor’s name who married him to his second wife began with ‘J’ shows the lengths you have had to go to. I thought the “insufficiency of the aortic kind” was going to lengths. I’ve got X, Y and Z covered. And Q. If only I’d written them up months ago! I’m going day by day right now. I don’t know why but I’m picturing Rev. Raynor’s life as a sitcom. You know, a young man and his wife, living with the wife’s mother. He’s working as a cook to put himself through school hoping to become a minister (did people go to school for ministry back then? ), but his mother-in-law is always giving him a hard time for “living in sin.” Throw in some wacky neighbours who refuse to admit they know him when the census people come around, and it practically writes itself! Hmmm… I did not see it that way. Fascinating stuff! I found my great-grandparents’ marriage license years ago, when I visited the county where they lived then. That was cool–and also raised some questions, when we noticed that it was dated a year later than the family had thought. My grandmother was born 9 months, almost to the day, after the wedding! 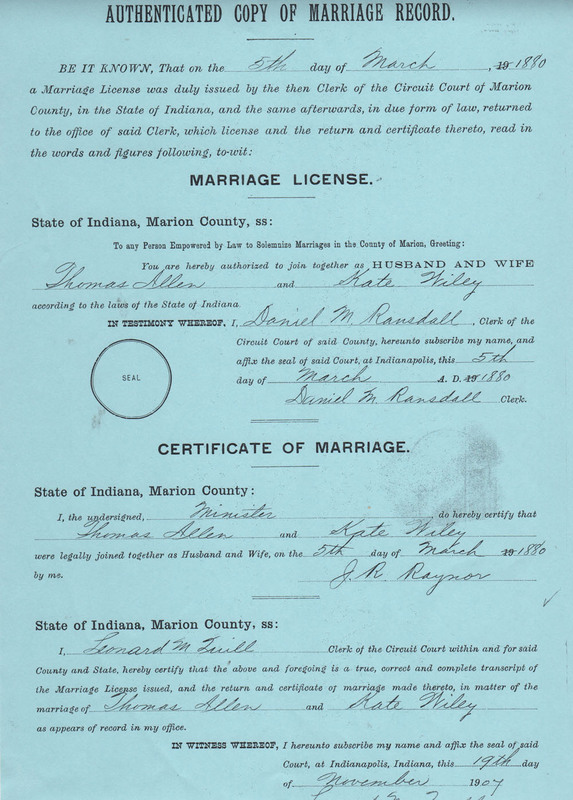 Yes, sometimes those marriage licenses tell secrets that had been kept for decades. This is a wonderful document to have, as are the news articles about the church. 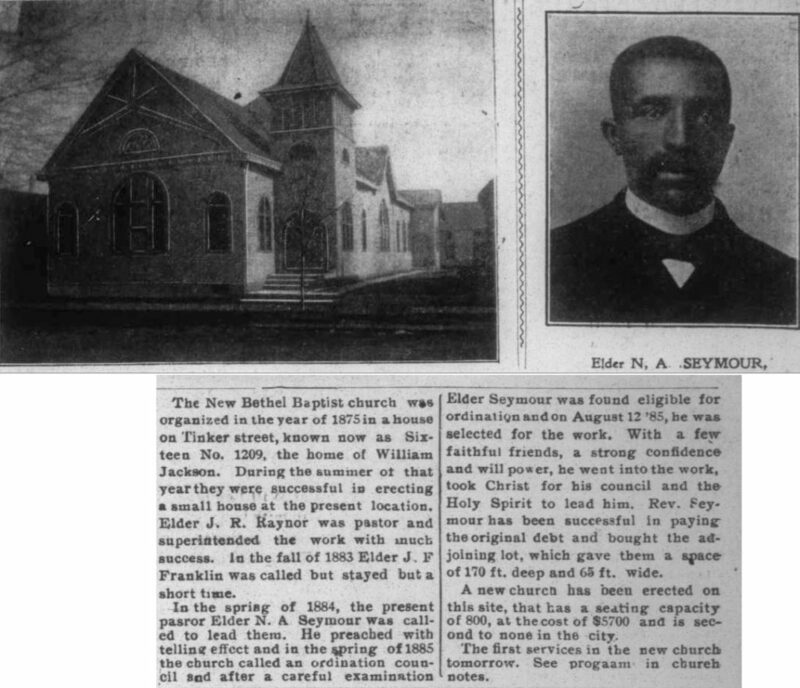 Researching Rev. Raynor was an excellent way to get a fuller picture of Thomas’s life. I have also done this for doctors who examined my Union Army ancestor when he applied for his pension (numerous times!) and it’s interesting to contrast their lives with my ancestors to amplify his story. I had to restrain myself from investigating Bert Delp, who was the notary on so many pages in the pension file. Fascinating stuff. Your research is impeccable. Old family histories sometimes indicate that someone had a “common law marriage.” Until I read this post and the comments, I never really thought about the possible reasons, possible family pressure to legalize the marriage, etc. It’s interesting to speculate about why couples in days gone by chose to (or not) legalize their marriage. People seem to be pretty much the same down through the ages. I like to see all these old documents. If only it had happened in the USA I could help! I don’t think I have ever come across a census entry that was empty, but for a name. Like you say, usually neighbors provide something — even if it’s wrong! Yes, those “helpful” neighbos… I never came across one like that before either. It really just had his name and dwelling number. What amazing research skills you have!